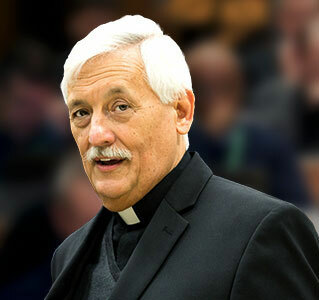 Born in 1948 at Caracas, Venezuela, into an open-minded Catholic family, Father Arturo Sosa was educated from an early age to cultivate an attitude of curiosity that goes beyond ordinary appearances. At the College of San Ignacio where he was sent to study, he discovered the beauty of helping others through the Marian Sodality. The Jesuit brothers he met during his studies impressed him, and he began to consider a Jesuit vocation. He entered the Society on September 14, 1966, and during his regency he was sent to Gumila, one of first centers of research and social action for peasant cooperatives. He then studied in Rome where he first experienced the international character of the Society. He then pursued studies in political science at the Universidad Central of Venezuela, and became editor the review “Sic” at the Centro Gumilla. At the same time, he worked at Táchira on the border with Colombia, on an interprovicial project in collaboration with Fe y Alegría. In 1996, he was named provincial and began to gather together vocation prospects, including those not interested in the Society, into a common project. In this context, he used the category of an “apostolic subject” to indicate how diverse vocations can dedicate themselves to a common mission. He also encouraged lay people to consider various possible formation opportunities. In this period, he participated at the birth of the Conference of Latin American Provincials (CPAL), which worked to unify the development of the provinces of the northern and southern regions of Latin American continent. He also worked on the development of the “Association of Universities” that was transformed from a small group of presidents and their associates into a much larger and more lively, interconnected corporate body. The movement of Fe y Alegría evolved at the same time into an international network. 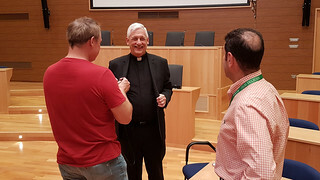 Father Sosa experienced the power of networking that allows for the allocation of resources into areas of scarcity and sustains initiatives in tenuous situations. In 1975 while he was in formation at Rome, Father Sosa met the general, Father Pedro Arrupe, and he was fascinated by him. Father Sosa participated in the 33rd General Congregation, where, at 34 years of age, he was the youngest delegate. He was also present at the 34th General Congregation, where he came to know Father Nicholás. With the 35th General Congregation he was drawn into the central government of the Society as a non-resident General Assistant. In that taxing position, Fr. 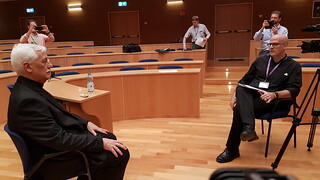 Sosa learned the importance of keeping alive the regular connection between the universal Society and its ordinary governance, not just during deliberative stages of a general congregation. 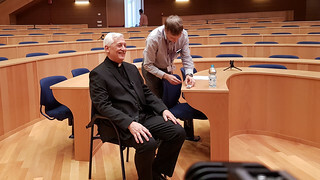 In 2014 Father Nicholás delegated him to take charge of the international houses at Rome. He left his position as Rector of the Catholic University of Táchiar and moved to the Eternal City. He immediately began work laying the groundwork that, it is hoped, will lead to the creation of a University Consortium among the three classic Roman Institutions of the Society of Jesus: the Pontifical Gregorian University, the Pontifical Biblical Institute, and the Pontifical Oriental Institute. During the days of the “murmuratio” at the 36th General Congregation, Father Arturo intuited that attention was focused on him. He received confirmation of that intuition on Friday, October 14, the day of his election. He was calm, and accepted the new reality with serenity. He realized that his brothers who had elected him had probably reread his own story as a faithful and creative attempt to put into practice what the congregations had decreed over the past 40 years. Collaboration, intercultural understanding, and cultural depth are themes that are at the heart of those Congregations. 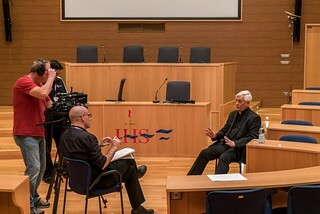 Collaboration not so much as a affirmation what has always been done, but also as knowing how to collaborate, is at the the heart of Jesuit life. Intercultural understanding is important because our God s not a homogeneous God, but altogether other and greater. Intellectual depth, and a comprehension of what is happening in today’s world and in the church, can assist us in rendering the mission of the Society more efficacious and visible.